Our city has a rich history of tolerance and a welcoming spirit. In the wake of executive orders on immigration policy, Lakewood City Council recently passed a resolution reinforcing its “commitment to hope, equality, tolerance, inclusion and optimism.” But what can our community learn from this hot-button issue? 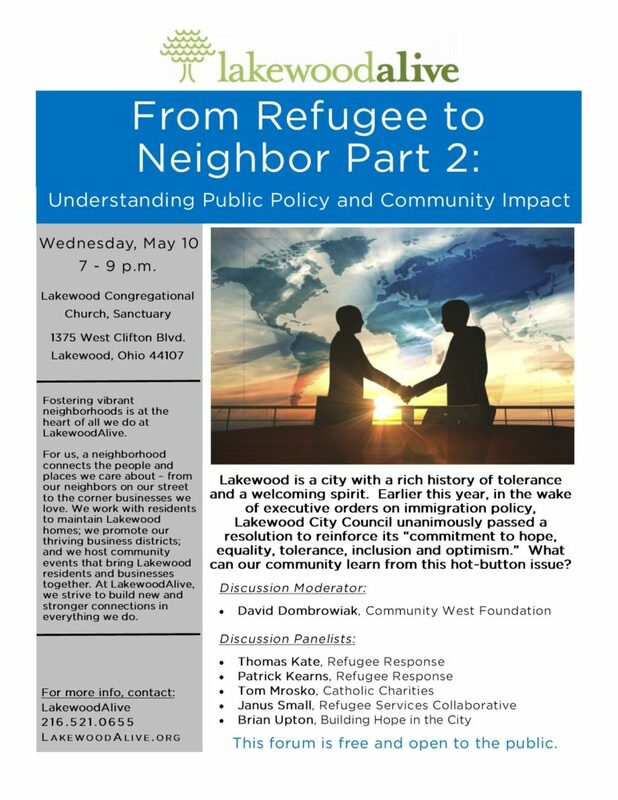 LakewoodAlive, a nonprofit community development organization, announces it will host a community forum – entitled “From Refugee to Neighbor Part 2: Understanding Public Policy and Community Impact” – from 7-9 p.m. on Wednesday, May 10, at the Lakewood Congregational Church Sanctuary (1375 West Clifton Blvd.). This community conversation will build on a previous refugee forum from November 2015 by providing insightful dialogue relevant to the current refugee climate. Both the general public and members of the media are invited to attend this free forum as the community seeks to listen, learn and reinforce our commitment to celebrating Lakewood’s growing diversity. The discussion will delve into our role as a resettlement location, how public policy impacts the refugee community and the progress that’s been made towards supporting refugees. Panelist Thomas Kate of The Refugee Response will share his personal story as a refugee to our region. Moderator David Dombrowiak, President and Chief Executive Officer for the Community West Foundation, will oversee a distinguished group of panelists for an informative discussion. The final 30 minutes will be devoted to panelists fielding questions from the audience. NOTE: Church entrances may be utilized off of West Clifton or from the parking lot. The parking lot entrance is handicap-accessible. Overflow parking may be available at Cornucopia, Beck Center and Horace Mann School. LakewoodAlive hosts community forums pertaining to topics relevant to Lakewood citizens. For more information regarding the “From Refugee to Neighbor Part 2: Understanding Public Policy and Community Impact” community forum on May 10, please visit LakewoodAlive.org/Forums.